Ok. I’ll say it. 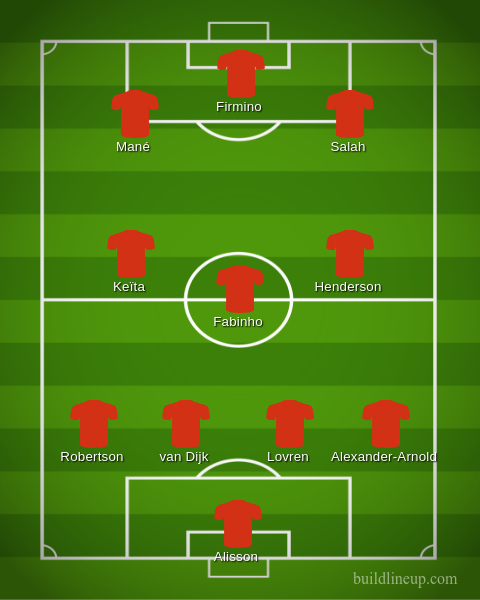 I think that Liverpool, with the players and manager the team now has, can challenge for and WIN the 2018-2019 Premiership. The team looks very balanced to me with world class players and some pretty good youngsters. Of course, there is no guarantee that the team chemistry will be good but, if there is one manager in the world who knows about instilling team chemistry grandly, it’s Klopp! On 20 July 2018, Liverpool named a 29-man squad for their USA tour to play against Borussia Dortmund, Manchester City and Manchester United which includes Karius, Clyne, Fabinho, van Dijk, Wijnaldum, Milner, Keïta, Mané, Salah, Gomez, Sturridge, Grujic, Klavan, Moreno, Lallana, Shaqiri, Robertson, Origi, Solanke, Matip, Phillips, Jones, Markovic, Ojo, Woodburn, Kelleher, Camacho, Chirivella, Grabara. and one forward: Rafael Camacho (18 years old). and Ben Woodburn (18 years old), a forward. Some of them will probably have an important role to play this year, whether it is in the leagues, in cup games or in the Champions League. It is going to be an interesting year for Liverpool supporters and players. I’m am very confident that Liverpool will excel this year and will win the 2018-2019 Premiership. Today, while surfing on the Transfermarkt website, I stumbled upon their list of the most valuable football clubs in the world. What I did was simply to separate the clubs into different tiers where two clubs appear in the same tier if their values are close to one another (I used 5% as a threshold). Real Madrid is in a class of its own. Then follows Barcelona but still alone in its tier. 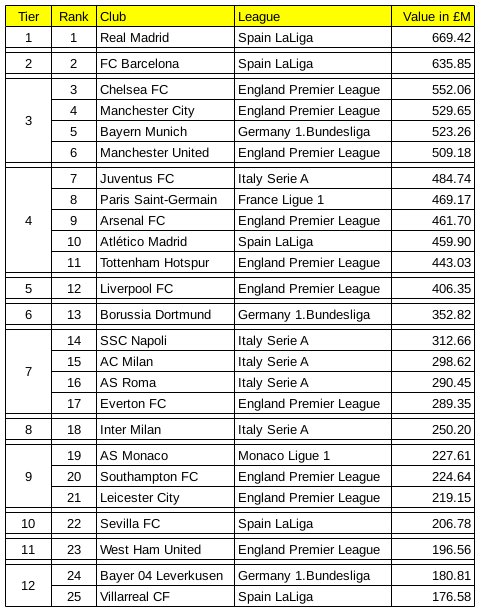 The 3rd tier is interesting as it includes four clubs: Chelsea, Manchester City, Bayern and Manchester United. The 4th tier consists of Juventus, Paris Saint-Germain, Arsenal, Athletico Madrid and Tottenham. In the 5th tier, we find Liverpool only. Most of these football teams apart from Chelsea, Manchester City and Paris Saint-Germain are historic clubs. This ranking also puts in perspective the difficulty for teams other than Real Madrid or Barcelona to win the Champions League. And it also explains, of course, why Liverpool still has to invest in a few world class (expensive) players in order to consistently compete against Chelsea, the two Manchester clubs, Arsenal and Tottenham. Jurgen Klopp is right: the time is for Liverpool to buy expensive and established players who can immediately slot in and improve the team. Liverpool should not buy second rate players anymore. Of course, Klopp is also keen to integrate young players from the academy into the first team. Interesting times ahead for Liverpool. But also, tough ones. And now for the others, top row first, from left to right. Born on 13 September 1961 in what is now Bosnia and Herzegovina, Zeljko is the First Assistant Coach which essentially means that he is the assistant of Jürgen Klopp, who refers him as “The brain” of the backroom staff. 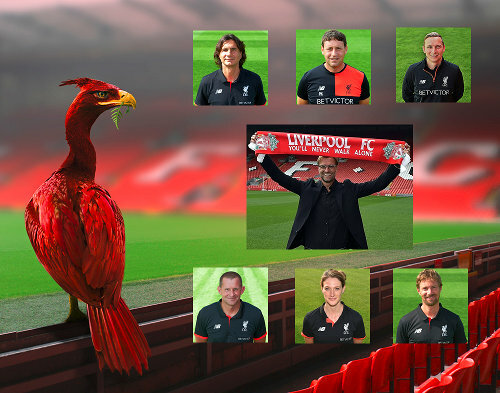 Peter is the Second Assistant Coach of Liverpool. Born on 31 December 1971 in Mainz, Germany, Peter excels in scouting and match analysis. Jürgen calls him “The Eye” of his staff. Born on 24 January 1983 in Venray, Netherlands, Pepijn is the First-team Development Coach. His job is to “assist Jürgen to develop a recognisable Liverpool FC style but also give young talent the chance to develop to first-team standards.” Jürgen considers Pepijn as part of “The Brain”. John is the First-team Goalkeeping Coach of Liverpool. Born in Utrecht, Netherlands on 8 July 1971, John was a former goalkeeper. According to Jürgen, John has the ability to be “a goalkeeper coach 24 hours a day” and “if you want to talk to him about anything [other than goalkeeping], he can lead every conversation in a goalkeeping direction”. Born around 1985 in Germany (I couldn’t find her exact birth date…), Mona is the Head of Nutrition at Liverpool. Quoting her, “I take care of the chefs, the projects, what quality of product we are buying, which components can we put on the menus depending on whether it is matchday minus one, matchday or what can be served on the bus after a game. Then it’s about when will it be eaten and what will be the last meal before a match.” She also adds: “Some players like to cook for themselves, some like to take away a packed bag with food in, but here we like to react individually. If the player wants a cooking lesson, or their wives or girlfriends do, we are free in the sense to help them with whatever they need.” She also says: “Football is difficult sport because on the one hand it is about endurance, but on the other it is strength, so I always try to update my knowledge […]”. Jürgen says that “Mona is the Heart and Soul” of the backroom staff. Andreas is the Head of Fitness and Conditioning. Born on 21 September 1974 in Munich, Germany, Andreas is the “drill sergeant” of Liverpool according to Jürgen. “He needs to be the bad boy from time to time because players don’t like running”. This is quite an interesting backroom team: 4 from Germany, 2 from Holland and 1 from Bosnia and Herzegovina. This is very different from previous staff which, initially, were mostly from Great Britain and then Spain. Kind of a very precise German piece of engineering with, of course, a “cool madman” at the steering wheel. I love it. Yonah on next year's iBook?